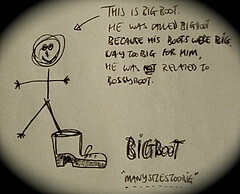 The thing about Bigboot is that he bought boots that were too big for him on purpose. Purposefully buying boots that were too big led people to wonder about him. What was he up to, buying boots that were too big for himself? Did he want to be bigger? Did he believe he was still growing? Did he simply want to be noticed? And, although people wondered many things about him, no one asked him directly why he’d bought these boots. Instead they started to treat him slightly differently. Bigboot felt the change. He felt people looked at him differently and no longer spoke to him the same way. As he observed the changes he grew more connected to the boots. The more distant people became the closer he became to the boots. Tags: Home, Hugh Hughes, hughs, Llangefni, Observations.